Monzite has been awarded a new contract to build high-speed switch drivers for the Eurofighter aircraft platform. The $155,000 award is for delivery of microelectronic components is used in the Eurofighter’s Electronic Warfare Self Protection System. The Monzite team is pleased to support this follow-on order for the long-standing European aerospace platform. Our engineering team continues to engage with the Eurofighter team for extending the relationship with additional projects. It started as a casual conversation at a trade show over the summer. We have been using Hirose connectors for years, and the company’s representative thought this 5G Switch Evaluation Board we built was a noteworthy mmWave Test application of their product. So, Monzite and Hirose decided to jointly present this info-graphic. Click on this image to enlarge or download as a PDF: Note: The switch featured here is high-speed, up to 40 GHz, SP4T built in a 12mm SMT package. Monzite introduces new switch drivers that supply higher voltage, current and switch fast. They are compatible with most standard MMICs. 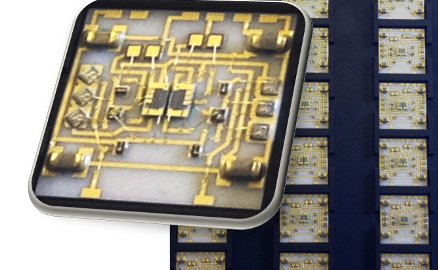 Our engineers have also developed the “MMIQ” new multi function assemblies, with multiple MMICs, transmission line, bias structures, all in a single QFN package. Autobonder in action! Diane Gallo and Dave Robbins discuss how the new autobonding capability at Monzite brings value to their customers, especially in support of military and aerospace electronic systems that are operational for decades.